Ricky Tims' Luminarium in FWB! 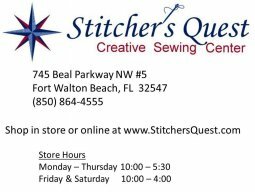 Stitcher’s Quest is excited to be a Promotional Partner for the upcoming Quilt Luminarium by Ricky Tims coming to the Fort Walton Beach, FL area in February of 2019! The Quilt Luminarium by Ricky Tims will be held at the Hilton Garden Inn in Fort Walton Beach, FL on February 2-3, 2019 (Saturday and Sunday). We want to make sure that you all are aware of this educational, fun-filled event, and we encourage you to visit www.quiltluminarium.com to learn about the details. Join Ricky for a two-day comprehensive quilt symposium that demystifies seemingly complex concepts, teaches mastery of unique techniques, and harnesses the power of the ever-elusive muse of creativity.